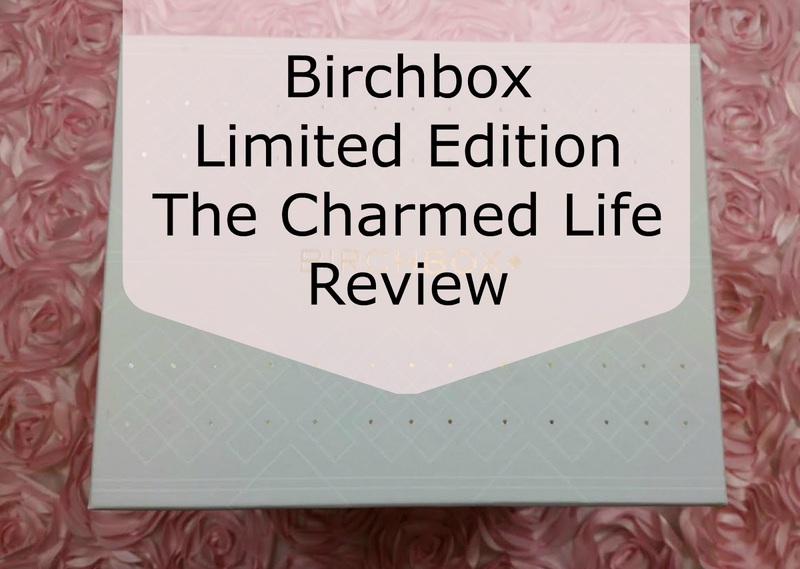 Birchbox does Limited Edition boxes fairly regularly but The Charmed Life is the first one that's appealed to me for awhile. 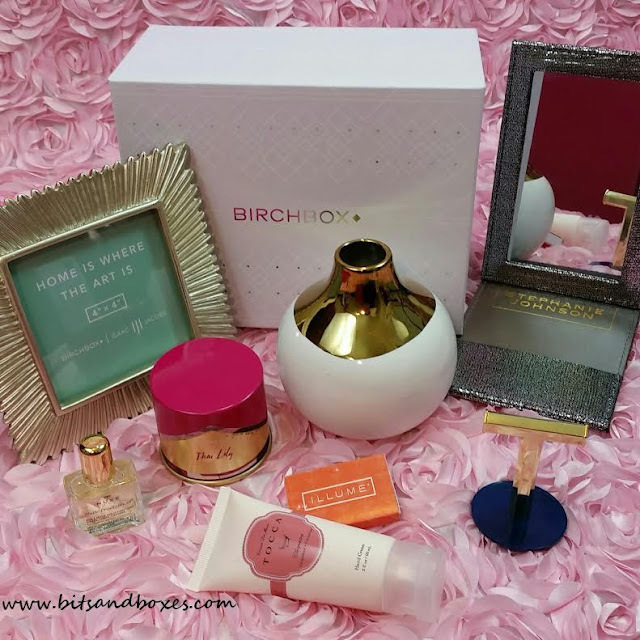 With Birchbox, if I don't love everything in the LE box, I won't buy it. Instead I'll buy the things I do want from it separately and usually with points. This time, I wanted all the LE goodness so I made sure to review all my box items and get as many points as I could. Then I bought it! 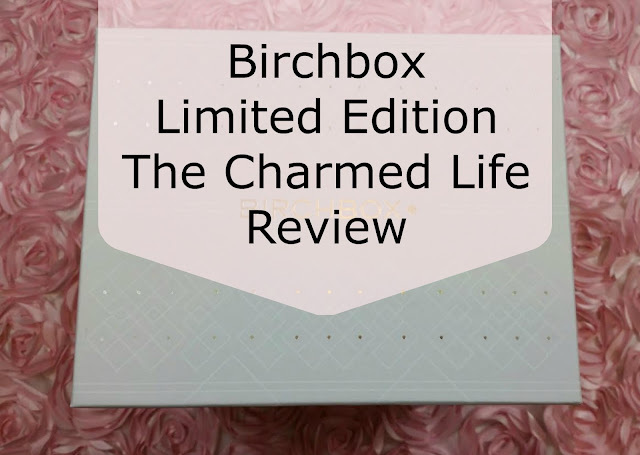 The Charmed Life has seven products in it and is $40. It's still currently available for purchase so if you want it, get it! Everything came neatly packaged and protected. I also received my Mystery Pick Two along with the box. It was a good one, too! Dr. Jart Micro Clear Water and a Pura Vida headband. Canvas Home Dauville Multiple Bud Vase in Gold- I love the Canvas Home Dauville line, though most of what I have is platinum. This vase is made of porcelain and has a hand painted gold glaze. It's the perfect size for a bud vase, too. I can definitely see myself putting a few tulips in it. 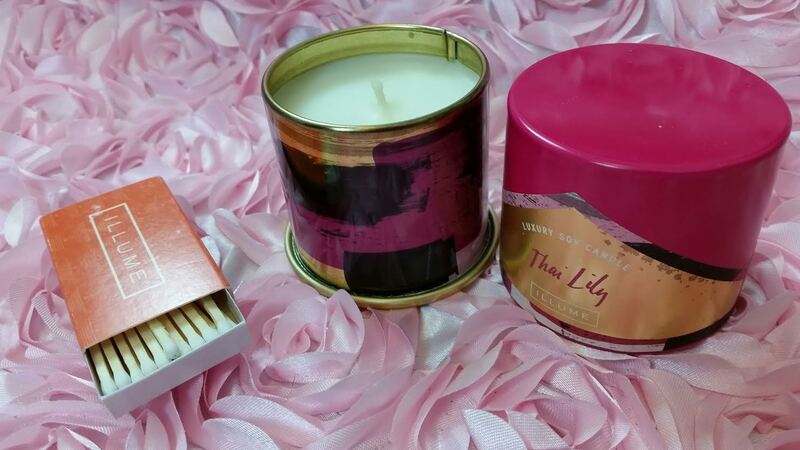 Illume Demi-Vanity Tin in Thai Lily-Exotic citrus notes of Bali mango, blood orange and white nectarine are deliciously blended with Brazilian teak and Asiatic lily, and finished with a hint of sensual musk. I really, really like this! It smells amazing and it's pink! 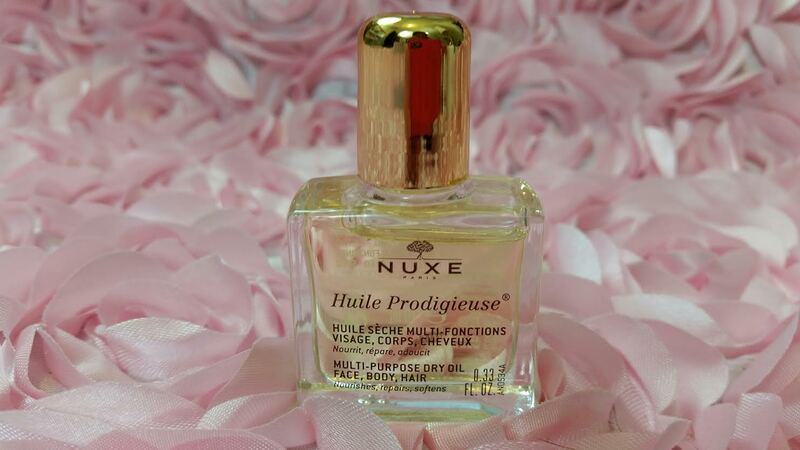 Nuxe Huile Prodigieuse Dry Oil- This multi-usage dry oil, made using six Precious Plant Oils (Macadamia, Hazelnut, Borage, Sweet Almond, Camellia and St. John's Wort), nourishes, repairs and softens skin and hair. Blend a few drops in with your moisturizer or serum. Spritz on wet hair, blend into foundation for a dewy finish. So, it's an handy dandy oil. While it's supposed to be used on the face as well as the body, it's very strongly scented. I just can't see using it on my face although that is what I was hoping to use it for. However, it's great on my legs so it'll get used that way. It made my skin SO soft but there is fragrance in this and it's quite apparent. Stephanie Johnson Folding Mirror- This is a silvery and black folding case with a mirror. It's not the best quality which is sort of true for most Stephanie Johnson stuff I've received. It had a "made in China" sticker in the middle of the mirror when I opened it up but I removed it. Value: Based on her other things, I'm guessing $30 but really... It's not that fancy or well-made. Tocca Crema Da Mano in Cleopatra- This is a grapefruit and cucumber lotion. 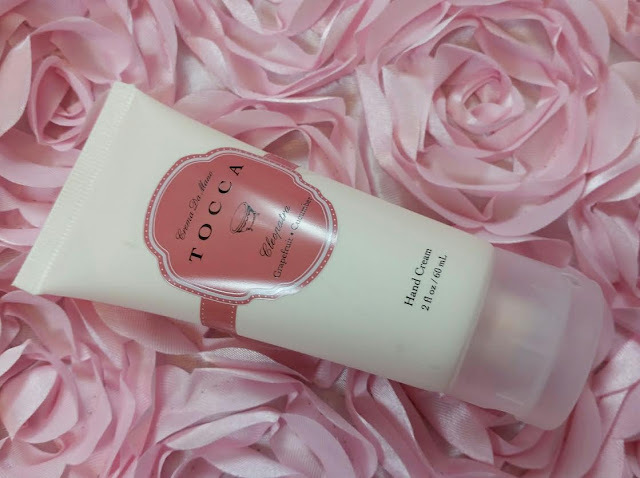 Enriched with natural extracts from coconut oil, shea butter, and aloe, this moisturizing, quick-absorbing hand cream will leave your skin feeling soft and silky. Happily, there's no lavender! Yay, a hand cream I can keep for myself! Umbra Geo T Ring Holder- This is heavy! It's got a circular navy colored base and a gold T bar to hold the rings. The bottom is velvety. I actually like this! I've been using the elephant one I got ages ago in a FabFitFun box. I think it's from Bauble Bar. I'm probably going to switch that out for this one. VERDICT: I really enjoyed getting this Limited Edition Birchbox! I'm excited to put all my new things where I want them to go and light my new candle. I've already started using the dry oil (and it really is dry, not oily at all). I'm bummed it so strongly scented but it's still usable. 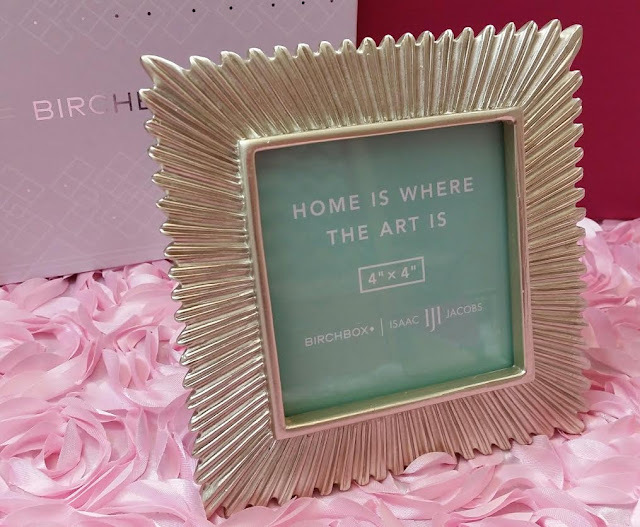 If you want to buy this box, you can buy it here at Birchbox. It's still available. When you buy do NOT forget to put a Mystery Pick Two in your cart! Always, always remember that when you have orders over $35 you get two free samples. I also got a little Fatty Sundays Toffee Pretzel this time. I have some codes you can try when you make your purchase: TAKEOFF20, WELCOMEOFFER20, MOBILE20, TAKEALEAP20, COMEBACK20. If you've already used them it won't let you use it again. 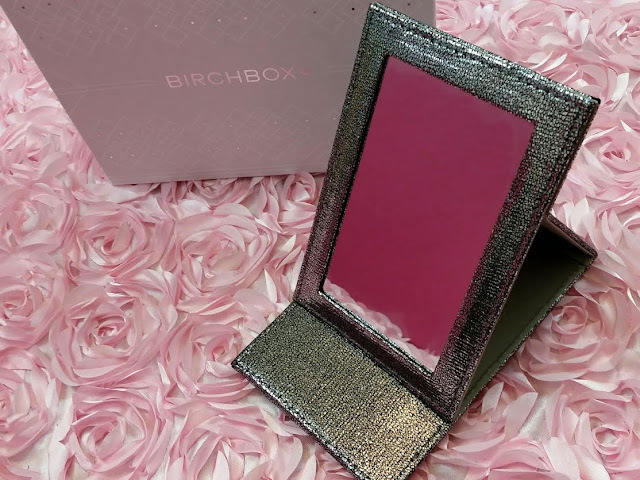 If you want to sign up for your own Birchbox subscription, you can do that here. If you do, use code BBJETBLUE10 to get $10 worth of points added to your account. 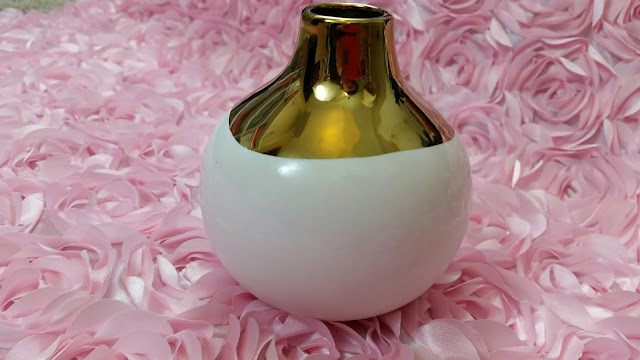 The vase - wow, I don't have anything from this line and it is solid / nice quality - I'm impressed. I don't have much gold but I have to find a place for it! 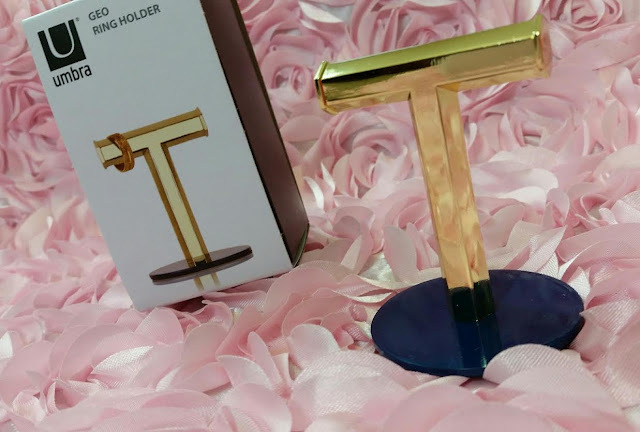 T Ring holder - again with the gold, this is nice but it's going to be gifted. Nuxe Dry Oil - I was a little worried b/c of what you said about the scent. I'm picky and my nose is super sensitive - I haven't worn this yet but I actually really like the smell from sniffing the bottle! Candle - mine is Desert Tulip and smells wonderful! The folding mirror - like you said, not super high quality but this is actually perfect for me to put in my travel bag - I hate not having my "make-up" mirror when I travel and I forget to pack mine about every 3rd or 4th trip it seems. And this folding mirror is a lot less breakable than my everyday one!! Picture Frame - I really like it! I find it to be way more silver than gold but that's my preference so that works well. :) The size of picture you have to put in it is a little strange but it's just like cropping so I'm sure I can find something. Really glad I got this, thanks for the review! I thought this was a great box. Isn't it nice when you can give parts of it away as gifts? Plus with that % off it was a steal! And you're right about the size of the frame. I've been having a hard time finding something to work in it. I definitely am going to have to cut something.